Sorry for the delay but it has been fairly crazy at work for the last week. So much so I have been working through lunch, late some nights and even went in for 10 hours last Saturday. So I have come home exhausted and not felt like blogging much. However, big project is wrapped up so I have a little more time now. It doesn't feel like U have lived here a year already! Still love this place and it's a great City. Saw SPEED RACER last Friday night on the OMAX. Oh, wow, it was fantastic! I absolutely LOVED it. More detailed review later. 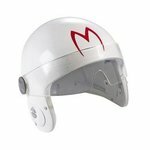 I seriously am tempted to get this Speed Racer helmet for my desk at work. It plays crash sounds and phrases from the Movie!